Arsenal will host Manchester City on Sunday in their first game of the season at the Emirates. Former Sevilla coach Unai Emery replaced Arsene Wenger as the manager at Arsenal this summer. The gunners are starting a new journey with a new manager at the helm and his first Premier League game is against the defending champions. Speaking ahead of the tie, Unai Emery said "It's more easy to speak here than to do it on the pitch. City, I think, after two years of working with Guardiola they have more stability, more security and when you watch City's matches, they are playing with a very, very great confidence in themselves. Also, I think that Guardiola's coaching is clear in this team. For that, we are working this week and preparing for this game and preparing for the opposition, against City, as a collective and as individual players. Above all, it's about confidence in ourselves to play the best match on Sunday. We are to think only to win the match." The Spanish manager who has coached Almeria, Valencia and Sevilla in the La Liga has never beaten a Pep Guardiola side, a record he would hope to change on Sunday. "I am 46 and he is 47. His career as a player is bigger than mine and his career as a coach is also bigger than mine. But we started at the same moment, our career as coaches. His coaches, with statistics and data, is better than me also. But I like to play more against him because it's demanding for your preparation, to try to win against his teams. When we were in Spain, for me, each match against Barcelona with Almeria and then with Valencia for four years, was very exciting and demanding. It's for that reason that Sunday is the same for me here. A new experience, but with one work with a lot of ambition for me. I want to show and to give our players also this ambition." 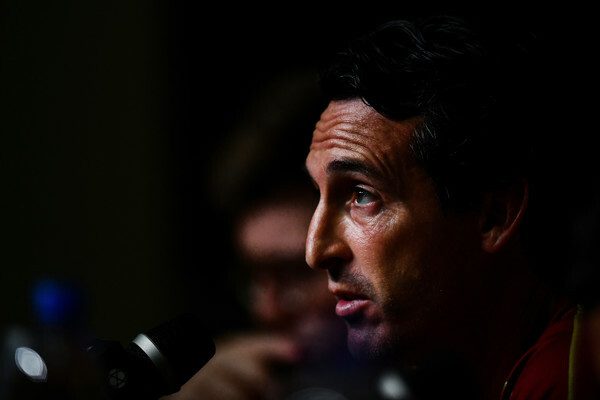 Though Emery refused to set any objective for the season, he did not rule out the possibility of winning the Premier League title at the Emirates, saying they have to stay optimistic. "My first message is clear. Think about each match. Enjoy the challenges of each match. I am looking every day and the players are smiling in training with a big collective spirit. They are working and finishing tired but with a smile also on their face. For me, that is the best message I can give the supporters. It's for that, my message for Sunday is optimism." The 46-year old manager has named Laurent Kolscieny as the club's number one captain with Petr Cech, Petr Cech, Aaron Ramsey, Granit Xhaka and Mesut Özil as the assistant captains, just as he announced on his arrival that he would appoint five players as captain. Concerning KSE's reported purchase of Arsenal, Emery has this to say, "I met the Kroenke family in Atlanta and he gave us his commitment in this project with Arsenal. For me, it's positive and his commitment is for me, to Arsenal, the most important."